VegaStar Carpentier captured this image of a Hunter’s Moon from Paris, France on Oct. 30, 2012 using a Canon EOS 1000D. 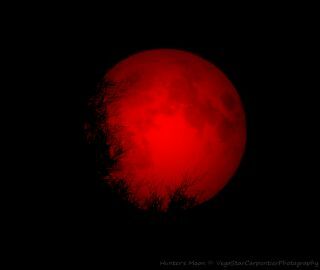 A menacing blood red Hunter’s Moon captures the spirit of Halloween in this night sky photo. Astrophotographer VegaStar Carpentier took this image from Paris, France on Oct. 30, 2012 using a Canon EOS 1000D. The Hunter’s Moon is a full moon named to mark hunting season in North America. It occurs right after the Harvest Moon, which is the first full moon closest to the Autumnal Equinox. The names of full moons were thought to have been given by Native Americans who kept a seasonal calendar of the year by naming the moons.